Ivermectin is a broad-spectrum antiparasitic active ingredient used in veterinary and human medicine in dogs, cats, horses ands and livestock against external parasites (lice, mites, etc.) as well as against internal parasites (e.g. roundworms). It is also used against agricultural and household pests. It belongs to the chemical class of the macrocyclic lactones. Click here to view the article in this site with the most common dosing recommendations for ivermectin used in domestic animals. Learn more about ivermectin safety. On livestock: Yes, very frequent in gastrointestinal roundworms of sheep, goats and cattle. There are a few reports on cattle ticks (Boophilus microplus) resistance to ivermectin as well. On horses: Yes, in gastrointestinal roundworms such as Small strongyles (Cyathostomins) and Parascaris equorum. On pets: Yes, reported in heartworm microfilariae in the USA (so far particularly in Louisiana). 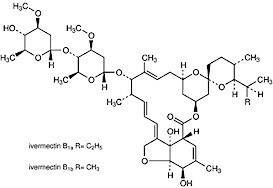 Ivermectin is a mixture of avermectin H2B1a (90%) and avermectin H2B1b (10%). Both are semi-synthetic derivatives of avermectin B1 and avermectin B2, which are obtained directly from fermentation extracts of Streptomyces avermitilis, and have the same spectrum of activity. Ivermectin is undoubtedly the most revolutionary parasiticide in modern veterinary medicine, the one with the broadest spectrum of activity, and the most sold. Today's sales of ivermectin products worldwide probably exceed 2 billion US$ at end-user level. After patent expiry numberless generics have flooded the market, especially for livestock. With very few exceptions most Animal Health laboratories, large and small, local or multinational have added one or more parasiticide brands with ivermectin into their product range. There are thousands of brands with ivermectin, alone or in mixtures. In livestock ivermectin is effective against the major parasitic roundworms: gastrointestinal (e.g. Haemonchus spp, Cooperia spp, Ostertagia spp, Trichostrongylus spp) and pulmonary (e.g. Dictyocaulus spp). It is also effecive against most mites and lice species, and against numerous myiases (e.g. those caused by screwworm flies, bot flies and warble flies) usually regardless of the delivery form (pour-on, injectable, drench or feed additive). However, at the usual therapeutic dose, ivermectin products are ineffective against tapeworms and flukes, fleas, mosquitoes, horse and deer flies and stable flies and several other flying insects. Cattle horn flies are only controlled by pour-on formulations. Cattle ticks (Boophilus spp) are only sufficiently controlled by pour-ons and high concentration (≥ 3.15%) injectables, not by the classic 1% injectables, drenches or feed additives. Other ticks (e.g. Amblyomma spp, Hyalomma spp Dermacentor spp, Ixodes spp, Rhipicephalus spp) are not controlled at all by ivermectin products. In horses, ivermectin is vastly used against gastrointestinal roundworms, e.g. against so-called Small Strogyles (Cyathostomins), Large Strongyles (Strongylus spp), Parascaris equorum, etc. and against horse bots (Gasterophilus spp). In pets, ivermectin at the therapeutic dose is an effective heartworm preventative (Dirofilaria spp) and controls a few other roundworms as well (e.g. Toxocara canis). The combination with a broad-spectrum nematicide (e.g. pyrantel) controls most pet roundworms (incl. ascarids and hookworms). However, alone or in combination with a nematicide, at the therapeutic dose against heartworm, ivermectin is ineffective against tapeworms, flukes, fleas, ticks, mites, lice and flies. After oral administration (mainly to sheep and goats) the type and amount of feed can influence ivermectin's bioavailability. Blood concentrations achieved are lower in grazing sheep than in those fed on hay or concentrate. It is known that ivermectin and its metabolites bind strongly to food particles in the stomach. And food type can significantly influence the time that feed remains in the rumen of ruminants before passing to the abomassum. The faster the food leaves the rumen, the shorter and lower is the absorption. It has been determined that a 50% reduction of food 36 hours prior to and after drenching increases bioavailability of orally administered ivermectin in sheep by about 50%, because it prolongs the time that food remains in the rumen. Distribution of ivermectin to all organs and most body fluids is sufficient to achieve effective concentrations against the major parasites after both oral, injectable and topical administration. Highest tissue residues are detected in body fat and liver. As all macrocyclic lactones, ivermectin acts as agonist of the GABA (gamma-aminobutyric acid) neurotransmitter in nerve cells and also binds to glutamate-gated chloride channels in nerve and muscle cells of invertebrates. In both cases it blocks the transmission of neuronal signals of the parasites, which are either paralyzed and expelled out of the body, or they starve. It also affects the reproduction of some parasites by diminishing oviposition or inducing an abnormal oogenesis.